Growing up, I never fancied myself as a cat person. I was raised with Dachshund's and never envisioned myself owning a cat one day. In November 2003, everything changed and I became a proud Cat Parent. I adopted a itty bitty grey kitty the week after Halloween and quickly named him Boo. He was so young when I got him that I had to bottle feed him. As the months went by, I quickly realized that my itty bitty cat wasn't going to stay that way - in fact, he was nearly double the height and weight of most of my friends cats before he was a year old! Boo is a very sensitive cat and those who know him will be quick to agree with me. He doesn't like cars, he hates loud noises and it takes him a while to warm up to strangers. Something else he is very temperamental about is his food. There is no need for an alarm clock in this house - if we are not up before 8am, he is pouncing on us for his morning meal which consists of dry food (aka crunchies). Nearly 20lbs of pouncing isn't a comfortable experience. When I work from home, I do not need my clock to tell me it is 4:00. That is his wet-food time (and don't you dare forget it). Along with being very temperamental about his feeding time, he is equally as vocal about his selection of food. He is by far the most spoiled cat I have ever met....only the best for Boo-Kitty and don't try to pull one over on him. As long as I can recall, Fancy Feast® has been his wet food of choice. He isn't as picky over dry food but if you bring home something other than Fancy Feast® , he will spend the evening meowing and following you around the house. Fancy Feast has been around for 25 years and it is apparent to my cat that they serve gourmet meals for furry friends. It makes me happy to know that my old man is getting balanced nutrition and high-quality protein sources while he stuffs his face. When I visited Target to pick up Boo's monthly Fancy Feast® 24 pack, I noticed that there was a special with the Litter Genie® Pail. When you purchase both, you get your choice of either a free Cat Toy or Friskies party mix cat treat. This offer is available while supplies last at Target through 4/11/15. The Liter Genie is something that Gabe and I have been looking at for a while - it's the same concept as the Diaper Genie but for cats!! 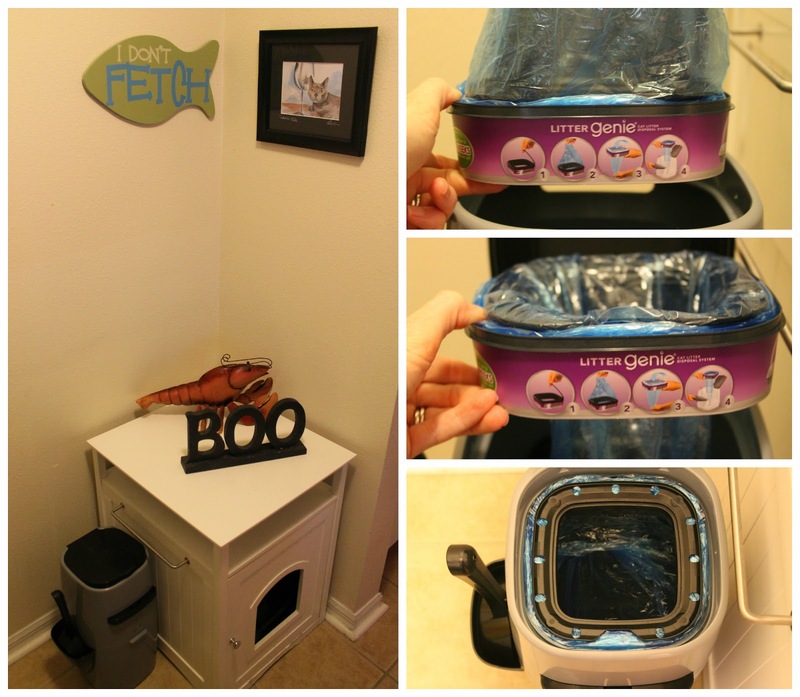 My loving husband is the one who does Boo's litter box so he was very excited when I came home with the Liter Genie. We live in a 1 Bedroom 1 Bath condo. While it is spacious at 1,000 SF, there isn't many hiding places for Boo's litter box, so he shares a bathroom with us. My favorite feature about the litter genie is that it is compact. It was simple to set up, as shown above. The starter kit came with 1 refill which lasts up to two months per cat, a scoop and scoop holder (which works on either side of the pail!). I found this youtube video online which showed step by step instructions to set up your Genie, and it was just as easy as it looked. You scoop the clumps from the litter box, open the lid to drop in the clumps, pull the handle/funnel to seal in waste & odors. Its unique air-tight design helps keep smells in even when you open the lid. I am sure both Boo-Kitty and our garbage men are excited over this new purchase!